Pinochle (pronounced pea-knuckle) is a classic game which peaked in popularity in the early twentieth century. As such, dozens of variations exist, for varying numbers of players, with partnerships and not, and introducing auctions to determine the trump suit, although the classic form (as described here) is for two players. Pinochle requires a modified deck unique to this game. The object of Pinochle is to score points by winning tricks and forming melds. Pinochle requires the use of a 48-card Pinochle deck. Some card manufacturers produce specialized decks for this very purpose, though they are, of course, lacking in utility for any other game. 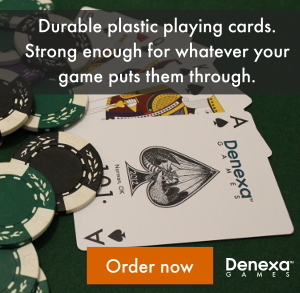 Such a deck can be made using Denexa 100% Plastic Playing Cards by taking out all of the eights through twos from two decks with the same back design and color, then shuffling the decks together. This will result in a 48-card deck with only nines, tens, jacks, queens, kings, and aces, in each of the four suits, with two copies of each card in the deck. You will also need some sort of scorekeeping apparatus. Pencil and paper work just fine, though if, through some sort of twist of fate, you find yourself playing Pinochle in an abandoned elementary school, you could just use the chalkboard instead. It is also possible to score using chips; give each player a pile or rack of chips representing 1,000 points, from which chips can be removed and transferred to a score pile as points are scored. Shuffle and deal twelve cards to each player, either three or four at a time. The 25th card of the deck is turned face up; the suit of this card becomes the trump suit for the hand. The rest of the deck is placed face down in the middle of the table, partially obscuring the 25th card (so as to keep it from getting confused with a card in active play), forming the stock. If the 25th card is a 9, the dealer immediately scores 10 points. Contrary to most other games, the cards rank “out of order” in Pinochle. The 10 ranks higher than the face cards, coming in right below the ace. Therefore, the cards rank (high) A, 10, K, Q, J, 9 (low). Game play begins with the non-dealer, who leads any card from their hand. The dealer then plays any other card to the trick. The trick is won by the card led unless the other player’s card is a higher card of the same suit, or a trump card (if trumps are both led and played then the higher trump wins). The winner collects the trick and places it face down in front of them—these cards are out of play and cannot be consulted for information regarding what remains in play. After winning a trick, the player may meld cards from their hand, placing them face up on the table in front of them, if able. Melding must follow certain rules, as described below. The winner of the trick then draws one card from the stock, followed by the player that did not win the trick. The winner of the first trick then leads to the second trick. Once a player has melded, they may play cards either from their hand or from their exposed, melded cards. Flush: A, K, Q, J, 10 of trumps, 150 points. Royal marriage: King and queen of trumps. 40 points. Marriage: King and queen of the same suit, other than the trump suit. 20 points. Dix (pronounced deece): The 9 of trumps. 10 points. 100 aces: One ace of each suit. 100 points. 80 kings: One king of each suit. 80 points. 60 queens: One queen of each suit. 60 points. 40 jacks: One jack of each suit. 40 points. Pinochle: The Q♠ and J♦. 40 points. A meld is formed by playing it face-up to the table in front of the player. For clarity’s sake, the cards forming the new meld should be grouped together on the table (this group will not necessarily stay together as play continues, but it should be clear to the opponent what is being melded at the time that it is melded). Upon forming a meld, the player immediately scores its value. A player can only meld when having won a trick, and then may only meld once per trick. The exception to this is to the dix, the melding of which does not preclude any other meld being made on that turn. 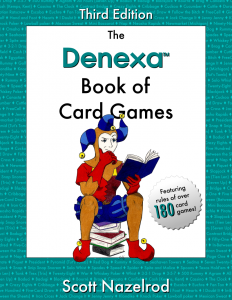 Instead of simply melding the dix, a player may also take the 25th card from under the stock and exchange it with the dix, taking the exposed card into their hand; doing so scores 10 points, just the same as if the dix were melded. A meld may also be made using cards on the table from previous melds. Such a new meld must include at least one card from the hand, and a card may not be moved to a meld that is both of the same class and of equal or lesser value. Only the highest-scoring meld is scored at any one time. For example, when melding a flush, you cannot also score for the royal marriage contained therein, nor can you later split the royal marriage out as its own meld (since this is a lower-value meld of the same class). However, you can meld a royal marriage and then later upgrade it to a flush by adding an ace, jack, and ten. In a similar vein, cards cannot be shared between two melds at once; for example, K♠ Q♠ J♦ may not be played at the same time to score for both a marriage and a pinochle, because scoring two melds at once is not permitted. As an alternative, the marriage can be played, and on a later turn the J♦ may be introduced to ruin the marriage like the little homewrecker he is. Despite being exposed and on the table, a melded card may be played to a trick. This card takes no part in further melding, however—it goes into the inaccessible won-tricks pile of whoever won that trick. When the stock is diminished to only one card, that card is exposed before being drawn by the player who won the trick. This is to make good for the fact that the loser of the trick will take either the upturned 25th card of the deck, or the dix that replaced it, which has already been exposed to the winner of the trick. The players then collect their remaining melded cards and return them to their hand. This starts the second phase of play. Play continues as before, except for two key differences: 1) there is no further melding, and 2) the player who does not lead off is required to follow suit, if possible, and if not, must play a trump; if trumps are led, a higher trump must be played. Play continues until the hands are exhausted. The winner of the final trick of the hand scores ten points. When a final tally is reached, it is rounded, with a ones digit of 7 rounding up and a ones digit of 6 rounding down. This rounded tally is then added to the player’s score. The next hand is dealt by the player who was non-dealer in the last hand. Game play continues until one player exceeds 1,000 points at the end of a hand. If both players exceeded 1,000, then regardless of who is ahead, game play continues, with the target score now 1,250, and then 1,500, and so on, increasing by 250 points until one player exceeds the target without the other. That player is the winner.